Quote Reply Topic: The joy of being ! This blog post is translation of an article published in marathi daily 'Loksatta' under column 'Ghatmathyavarun' on 26th April, 2017. For the past 12-13 days I walking southwards on the Sahyadri plateau. As the plateau here slopes down gradually, stepwise towards coastal strip in the west, I could not see the western cliffs of the mountain range. However as I reached Kurungawadi, situated at the foot of Kulang fort, I could see the steep descent of the cliffs jumping down to the Konkanstrip. I was now literally 'walking on the edge'! The landscape thereafter was a feast to the eyes. Kalsubai, Alang-Kulang range, and then Katrabai pass near Ratangad and then Harishchandra fort via Pachnai- the journey through these mountains was a dream come true- literally and figuratively. 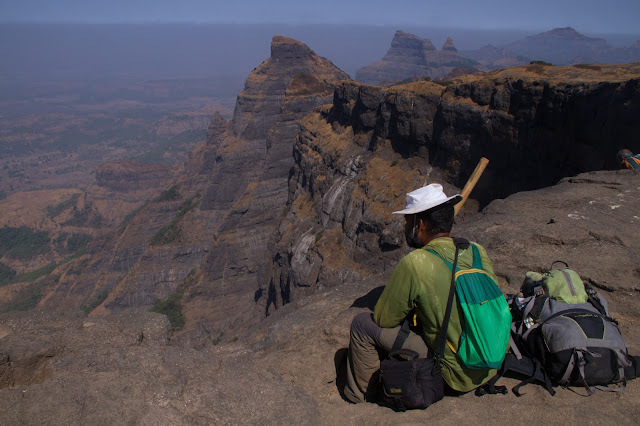 As I sat on the edge of Kokankada at Harishchandragad, I realized that this was the 30th day of my expedition. The exact midpoint of my 60 day journey. I thought of the efforts that went into the planning of this expedition. I was to undertake the complete journey alone, but it was made possible only by the efforts of so many people, who worked untiringly as a team. Route mapping, procuring the necessary equipment for the documentation of the life of the mountain people, and the costing, needed to be taken care of. At various pre decided destinations, various friends came to meet me and they were assigned the task of providing me with the necessary supplies, as I could carry only a limited amount of luggage with me. The travel costs of these friends, the cost of equipment, cost of guides, who would be needed in difficult unknown areas- all these expenses had to be met. And the required amount was considerable. Trekkers, who found this expedition fascinating, lent a helping hand. Mr. Rajesh Gadgil of Jai Kajal partially sponsored this endeavor and also personally gave some amount. Mr. Vasant Limaye also helped. With this help the expedition seemed more of a reality and not just a dream. I received great help from the villagers here. They welcomed me, fed me and gave me a bed. Trekking and tourism is quite unknown in the region from Satpuras to Traymbak. It is therefore not seen nor exploited as a source of income. People here would not accept money in return for food or shelter or as guides. Homestays or food as service rendered for money is not a known concept. At times I was in a fix. Do I offer money for the food or would they take offence, was the perpetual question that I faced. After Igatpuri however, the situation is different. Harishchandragad, Kalsubai have earned quite a good name as eco-tourism and trekking destinations. Locals here have now acquired the necessary skills and offer their services as guides or homestays or as local food joints. It is mutually beneficial for both-the trekkers, tourists and the locals, whereby, the one gets required facilities the other the much needed money. Were the regions around Satpura and Bagtaan to develop as eco-tourism or trekking destinations, they would benefit the locals similarly and also attract people in this beautiful area that still remains neglected. Ruminating over these thoughts I was sitting at the Konkankada with Dhananjay Madan, an experienced trekker, who had accompanied me on this stretch. His encouragement gave me the required strength to complete the rest of the journey. As we sat there, I looked around. Konkankada offers a magnificent view. I sat there mesmerized by the beauty around and I had sudden tears in my eyes. Tears of gratitude, gratitude towards all those, who made my dream possible, tears of happiness at the sheer beauty of nature. Tears of joy that I was back in my beloved Sahyadris! Tears of happiness for being here, for just being!